As I live in Japan, I recently picked up a few nice framed pieces of original artwork by Goseki Kojima from an art dealer here. After displaying and appreciating them for a while, I will likely send them into ComicLink or Heritage to auction. Here's a preview. Pretty cool, yeah? Looks great! Are pieces like these common in Japan? The Lone Wolf artwork is his most recognizable and sought-after work, but his career was pretty extensive with other manga series from the 70s through the late 90s. There are original sketches and extensive art pieces to be had, if you are willing to pay for them. He died almost twenty years ago, so his nicest works are in the hands of galleries or private collectors here in Japan. Very few pieces trickle over the pond. I've written about this a few times here over the years, but it's been a while. I went to Japan roughly 60 times in the late '90s/early '00s. Spent a fair amount of time hunting Kojima LW&C art specifically. Learned a lot. Met several collectors. Nothing published is available. There are many, many sketches out there. The one you show at the top is a common go-to pose; of all the Itto Ogami/Daigoro pieces he did, this is the one you'll see the most. All variations on a theme. 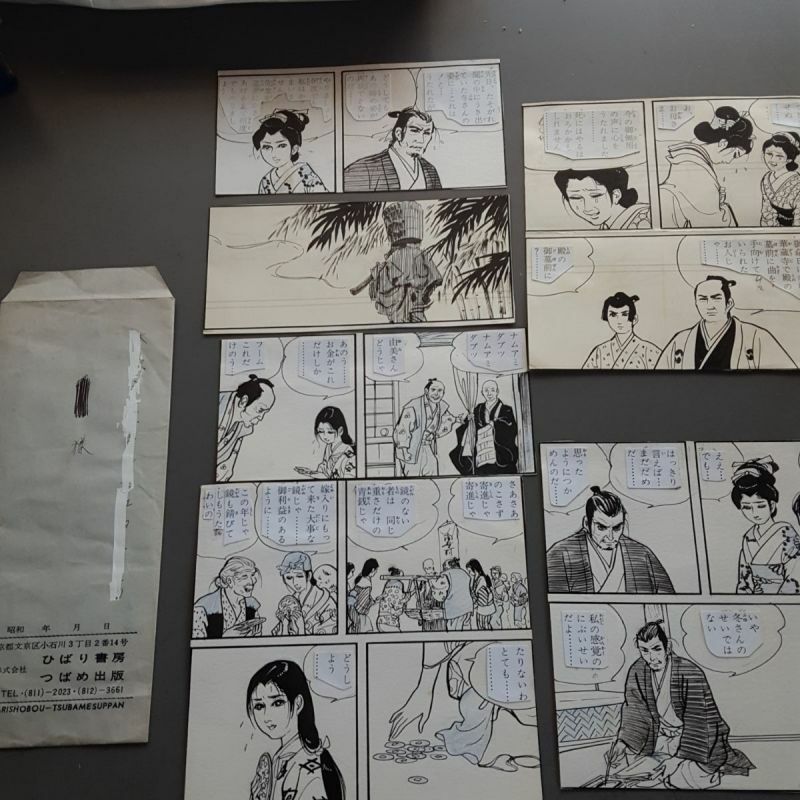 Daigoro pieces were most plentiful at that time...anecdotally, it's something like 10-1 ratio of Daigoro to Itto Ogami sketches. Daigoro is considered the "hero" of the story; the original collections mostly featured Daigoro alone on the covers. Learned a bit more as well, but those are the main bullet points. I wrote about all this in a CFA-APA article years ago. I don't have it at my fingertips, but anyone who has the back issues can probably find it. Thanks. When you say nothing published is available, do you mean it is in the hands of collectors that won't let them go or it has vanished? I have heard original Speed Racer cells do not exist. I was a researcher at Sophia University more than a decade ago and I developed a deep appreciation then for woodblock prints. I have this Sgt. 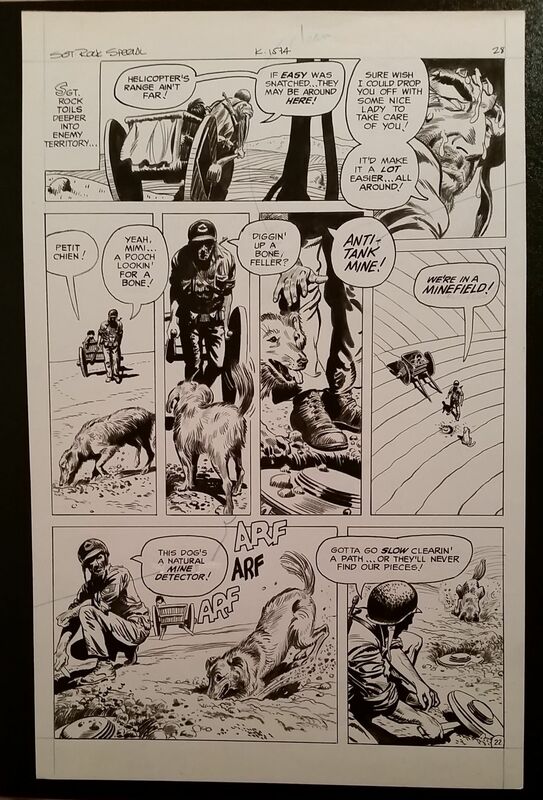 Rock Special page by Doug Wildey that has a homage to Lone Wolf and Cub, or at least that is what the seller was telling me. But I thought it was a nice page anyway. My understanding is that the original publisher has all of it. I've come across panels from his works other than LW&C.